Aquafit is another name for water aerobics classes. The water provides resistance to strengthen your muscles and raise your heart rate while minimizing impact on your joints. During the classes, you may perform calisthenic-type moves, use the water resistance while exercising with floaties, tread water, walk or jog -- all in waist- or neck-deep water. Although the calories burned vary, you may burn more than 200 calories per hour in an aquafit class. A calorie is a unit of measurement that describes energy. When you exercise you burn calories or expend energy. The more calories you burn the harder you have exercised. In terms of body weight, 1 pound of fat is equivalent to 3,500 calories. The stored energy in your body fat can provide a lot of calories during your exercise routines. A person weighing 125 pounds can burn an estimated 240 calories during a one hour aquafit workout. A person weighing 185 pounds may burn 356 calories during the same workout. The heavier you are the more energy it takes to do activities because your body has to move more weight. However, these are only estimates -- calorie burning during exercise varies, depending on your weight, fitness level and the exercise intensity. Body weight is not the only factor that affects how many calories you burn during an aquafit class or any other activity. Intensity of exercise is the biggest key to calorie burning. There is a direct correlation between intensity of exercise and caloric burn, according to the National Strength and Conditioning Association. This means the harder you push yourself during your aquafit class, the more calories you burn. You also increase the benefits from exercise such as improved endurance, stronger cardiovascular system and healthy body weight. 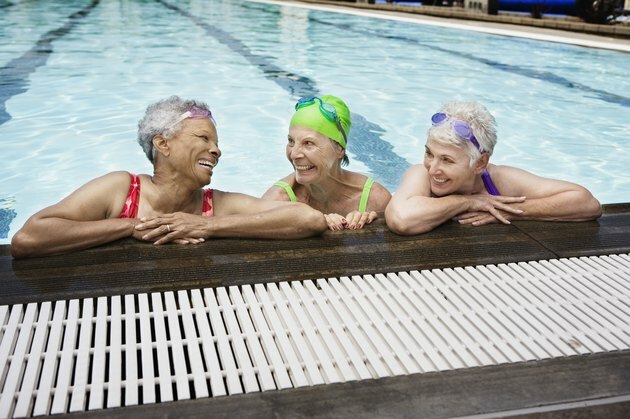 If you want to improve your overall health with aquafit classes, exercise three to five days per week for a minimum of 30 minutes at a moderate to high intensity. If weight loss is your goal, increase your frequency of exercise to five to seven days each week and duration to 30 to 60 minutes each session. This will help you maximize caloric burn and lose excess body fat. If you are new to exercise or have a chronic medical condition, see a doctor before you begin any exercise program. Start any exercise program, including aquafit, slowly and always listen to your body. Stop exercising immediately if you feel sharp pain, or are light-headed or nauseous.